You are here: Home » Australian Senate (PUP) v QLD Premier Campbell Newman and the dodgy judiciary. Why it’s a good idea. Tuesday (30/9/14) the Federal Senate voted to have an inquiry into the Queensland Government which is headed by Premier Campbell Newman. I think it is a great idea and long overdue and was always going to get the support of this website given there will be a review of certain elements of the judiciary as part of the Senate inquiry. People are saying what Clive Palmer has done is motivated by a vendetta and that is possibly true. Others say he is crazy and that might be true as well. But the political and judicial system has needed a shake up for a long time and Clive Palmer should be given credit for attempting to do it. There could and should have been a national inquiry into judicial appointments and judicial corruption long ago and the Senate inquiry is a start. Tim Carmody must be extremely bad to upset all the other judges most of whom were appointed in a dodgy manner themselves. Obviously there is no honour amongst thieves anymore. The Trade Union Royal Commission is meant to be about union corruption but has already had three current judicial officers as witnesses. All three were appointed for political reasons/personal relationships, not because of their ability. That gives an insight into how the judiciary really works. The Royal Commission only called three judicial officers as witnesses. Imagine if they had have called more. How dodgy would they have been? Add the above three to Tim Carmody and then you are starting to get a true picture of the judiciary in this country as it is only the tip of the iceberg. The Australian judiciary is in crisis and needs a major overhaul. If the Queensland government has nothing to hide then they have nothing to fear and that is the way it should always be. But like most governments they will have skeletons in the closet. Once the Senate inquiry is finished in March next year they should start on another state until they have all been investigated and then start again. If every state government knew they were going to be investigated regularly then they wouldn’t be so corrupt in the first place. A lot of voters want change because they are totally dissatisfied with the two major parties and they are prepared to support someone such as PUP who can deliver that change. Even if Clive Palmer is crazy and/or running a vendetta. Some people are predicting that PUP will lose a lot of votes at the next election because of the Senate inquiry but the opposite might be true. I’ll be keeping a close eye on the judicial element of the Senate inquiry as it might set a precedent that is a real game changer as far as the judiciary is concerned. The inquiry would have more legitimacy if it included the Bligh and Beattie years, when most of the damage to Queensland’s economy and government was done- which is why Newman had to resort to unconventional methods to fix up the mess – and lets not forget they had a commanding mandate from the people of Queensland to do so. We, in Queensland don’t have an upper house of review and with the current unrepresentative swill occupying the Senate benches, lets keep it that way. What a waste of money and resources. @2 Bobs Worth – If Qld had its own house of review we may not have been in the mess we are in. That may turn out to be a hypothetical (as corruption was endemic in the old NP and the ALP,) but there would be no stopping any future corruption at all without the addition of an upper house. Governments use their ‘smiling face’ image to try and fool voters at election time, but the problem is that the damage has already been done. It’s no use politicians like Brandis and Abetts saying “let the voters judge the government at election time’ – it’s already too late by the time the next election is due.. Traditionally and with a fair degree of predictability, Australian voters do not vote good governments in – they invariably vote bad governments out – and the LNP government here in queensland could soon be facing the same fate. Surely an investigation of this nature (complete with ‘whistleblower protections intact) should happen well before an election, so that the people can know if there has been anything worthy of reporting in terms of government and judicial corruption? @ Two bobs worth, is right there is no legitimacy in this forthcoming inquiry without full coverage of the dysfunctional garbage that came before the cure. A similar situation is enacted in the federal issue. You can smash a car in two seconds but to repair it takes a lot longer. The rot seemed to start with the knifing of Hawke when Keating took over, these politicians done some really creative reforms during their long period of government. then the sour grapes started that got rid of the Labour mob. Stable government lasted for eleven years with Howard, Union power within the Labor party ditched the Howard government with work choices, much too fair for the greedy union controlled Labor party. Then here we go out come the Knifing mob again, first Rudd then Gillard then Rudd now we have the union puppet Shorten who couldn’t run a darts team raffle but good at wielding a weapon. Aussie voters will have to learn to train their memories to think over longer periods than three years. Or as a earlier comment stated Australia never votes in good government they just vote them out. Allan Usherwood from Myalup. Most of the damage was definitely done under Bjelke-Petersen. But after the royal commission the ALP didn’t clean up corruption. They simply took over the reigns. I witnessed a lot of corruption myself that didn’t make it into the mainstream media and we’re all aware of what did. Winegate with one MP accusing the CMC of misrepresenting his written testimony and the CMC ultimately doing their usual trick – of taking too long to conduct an “inquiry” where they find something “wrong” happened but also some technicality to avoid prosecuting anyone. The University of Queensland nepotism scandal where the VC “innocently” asked if there was anything that could be done to get his daughter into the medical program. Three years to produce a report that is pure fluff and for the guilty party – UQ – to recommend further narrrowing the legal definition of misconduct. And I know for a fact the CMC lied in that report. They are perfectly aware of the severe bullying and reprisal that staff who complain about misconduct at UQ suffer but treat the failure of senior staff to come forward sooner about this issue as a mystery. I submitted a complaint to the parliamentary committee who theoretically oversees the CMC. But complaints about the CMC actually go to the CMC who then do what the only thing they’re good at – come up with stupid reasons to not investigate actual corruption. I completely agree that the scope of this inquiry is too narrow. But that’s politics for you. Would the federal ALP have supported an inquiry into their own corruption in QLD? Probably not. That said, I would fully support a broader inquiry into political and judicial corruption in Queensland and could provide a buttload of evidence, some of it extremely damning. Eg. QLD courts doctor evidence with impunity. Try to get recordings of hearings where judges misbehave and they’ll refuse to give them. Instead they make you wait months and give you obviously doctored transcripts (with eg. the judge saying something which makes no sense because it refers to the previous thing they said which has been edited out). No need for a convoluted investigation. Compare tapes to transcripts. I saw a lawyer about one matter who failed to detail the full extent of his relationship with the other party (UQ) and who told me to ignore the advice of the federal regulatory body (HREOC) in UQ’s favour. Pretty dodgy. And gosh a few years later this lawyer who screwed over a client to favour the government…. is appointed as a judge. If they are going to investigate Campbell Newman then how about they investigate Anna Bligh with her corrupt Government and disgraceful spending of taxpayers money…..she is one person who should be held to account for the disgusting debt that Queensland inherited…. I never said I support them. I said I support the inquiry. You say “this State government is actually fighting corruption in the courts .Judges etc” How many judges in Queensland have been investigated or charged or gone to jail in the last few years. None that I know of, so the State government aren’t doing anything in that regards. Shane – stop inhaling ! Clive is more erratic than a V8 firing on Four cylinders . This is just political payback by Clive P and a mega abuse of power and waste of money. Shows how damaging minor parties with an agenda can be . As for you I thought you were a lot smarter, obviously not. Agree Rank Frank – the labor party are the corrupt ones – leave Newman alone – and I am NOT a queenslander. I think Palmer is a fraud and may well land in jail. Good god… How can this inquiry have any legitimacy given that it’s terms of reference only target the period of the Newman government? And to leap to its defence as a good idea? Maybe if it had only targeted judicial appointments period rather than a selective timeframe that just happens to coincide with the period that somebody Clive has declared to be an enemy came to office in QLD. Did you miss that it failed to get off the ground when Bligh’s government could have also been investigated? But when a deal was reached with federal Labor to protect their state counterpart from scrutiny, Billy’s boys and girls were more than happy to have this thing ramrodded through. A petty, politically motivated stunt… And that’s even before the arguments about whether this inquiry is unconstitutional. No, the only corrupt judges the witch hunters of this inquiry will find are the ones they decide are friends of the QLD Liberal party. This is an obvious witch hunt. Palmer is a blustering loud mouth bully using tax payer funds to damage Newman prior to the Queensland election. Shane, it trivialises your site to give Palmer oxygen. The Senate would be better employed investigating how Rudd/Gillard and the Beattie/Bligh ran up massive debts. I’m with you Shane, regular enquires in all states and territories into crooked judges and crooked court practices. Palmers motives may be suspect but if the courts are cleaned up, which is badly needed then well done. As I understand it, the results of the enquiry will be announced during, or around the time of the next Queensland election. Whether or not the enquiry is justified, you can bet that the results will be detrimental to the Liberal Coalition government….at least, be formatted to ‘question’ the sitting government…at a vital time. That is just outrageous and should be changed to months before, or after the election. Warwick, absolutely correct and shows the true reason for Palmer’s enquiry! Shane, your support of the enquiry fails to address the politics of the event. If it was fair it would be investigating the former government as well as other State Governments and would produce results that don’t impact on free and fair elections! A vendetta for Clive Palmer should be denied! Alan, you say “your support of the enquiry fails to address the politics of the event”. The same could be said of my support for the Trade Union Royal Commission which has clearly been motivated by politics to a degree. It is far from perfect. Even so it is a good idea. It is up to every individual to become a hero and do their bit to help and then we will get real change. That is starting to happen and will happen unless of course we become negative and say it can’t happen. Maybe they are more worried about him not being as dodgy as they are? If he was really one of their own they surely would have been happy to have someone with skeletons they could drag out if he got out of line wouldn’t they? I see some Greens spokeswoman last night saying people will only be “invited” to appear before the inquiry, not compelled, so as to keep the senate out of the courts. Wonder why they don’t want to have their inquiry challenged in the courts? Afraid of too much light on themselves? @Tony – I can’t argue with what happened about the railway line re the Galilee Basin mine, but I can say with confidence that we don’t have an upper house of review – so who’s going to do the “reviewing” Tony? If all of the premier’s men were corrupt, do you think that they’d be admitting it? Do you think that Newman would be handing himself over to the CCC for investigation? NO! Perhaps the issue of the federal Senate investigating state government should go to a referendum, and then it will be enshrined in our constitution, where it can’t be tinkered with or blocked by dodgy politicians and their minion,s of whichever flavour you care to name? Both the ALP and the current LNP have escaped any serious scrutiny before now, and you and your (LNP supporter?) friends want to torpedo this current effort too? Shane, up to this point I have agreed with most of what you have said, but with this one article alone you have lost me! All this is, is clive palmer’s personal spat with Campbell Newman, and now how much is that going to cost us? Agree or not, but Campbell Newman has done well he has done many things that needed to be done, including it seems to have broken the back of the OUTLAW bikie gangs in Queensland, even they like you support this inquiry. Maybe he hasn’t done all the right things, he appears arrogant and he certainly has upset a lot of people, but like all politicians he will be judged by the people at the ballot box and in Queensland’s case that will be early next year. Shane you and the others that support this sham of inquiry are totally out of order. I hope you leave this one alone because YOU ARE WRONG! I have a feeling that this may come back to bite Palmer well and truly on the bum. His inexperience in the political game will be exposed. As for Glen Lazarus chairing a Senate inquiry, are you kidding? He cant even read out a motion from a pre written page. This will end in tears, and by the look of the CiticPacific case in the courts, Palmer may very well be answering questions himself. And he wont have his puppies running that court. Hello Shane. I agree with previous comments. Just maybe Tim Carmody represents what is good and the pompous existing and retired judges who think that they know everything also know that Carmody will not join their “club”. Perhaps you know something that we don’t. As for Senate Inquiries these would certainly be a good thing if all Governments were subject to them on a regular basis. This one is obviously designed to harm the LNP prior to an election. I wish some one would kick Palmers out of the parliament including his crackpot senators who were voted in because of our stupid election system. (democracy ha-ha). He is a worse danger than any Islamic militant mob to our democratic system. He is using his money not his conscience to denigrate a leader who is trying his best to rectify Labor’s disastrous rule under dysfunctional and corrupt leadership. Palmers costly vendetta to get back at Campbell Newman’s refusal to give him his way and reject corruption in his new government Newman has put the syllable “govern”. Back in the word Government. I notice Shorten curlies mob refused to support Palmers bill while it included Anne Bligh’s leadership. I see Shortens alleged victim has spoken out at last. Allan from Myalup WA. Who has confidence in Justices Muir, Fitzgerald and Chesterman? If the Senate is setting up an inquiry into one state government then it must inqire into all state governments. Glen Lazarus is as thick as two bricks so he’s among equals in the opposition in the Senate. Senator Lambeth has a quota of 25K votes from Tasmania – talk about the tall wagging the dog ! The Senate is an anachronism , a waste of time and money and a blight on good government in Australia and must be abolished. Murray, you may recall Paul Keating’s view of the senate – unrepresentative swill!! How much of a roll does someone like Palmer with all his money and his predisposition to litigation contribute towards the corruption of the Judiciary? 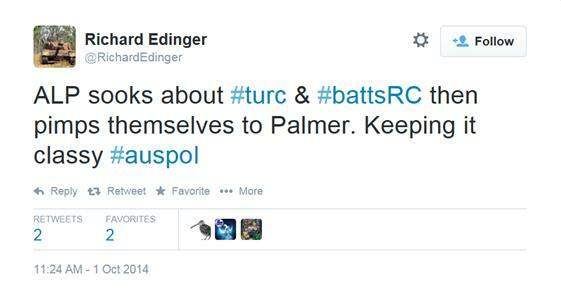 I think it has a huge effect, and I think there is a conflict of interest there with Palmer currently suing Newman. The senate investigation is a lazy way of discovering facts, which Palmer would seem to need to prove his case. I couldn’t care less about the Senate Inquiry. Things are great in the Sunshine State since labor was decimated, but don’t tell anyone or we’ll get more people moving here. The reaction of the old boy’s club to Carmody’s appointment shows he was the right choice for the job. Tony Fitzgerald should shut his mouth and worry about his armed robber son, instead of trying to tell Queenslander’s what to think and how to vote. I don’t know…I quite like the odd gadfly in Aus. politics who shakes things up and scares the hell out of the loyal Globalists we always seem to see installed in our Parliament (regardless of how we seem to vote). I don’t care really what his motivations are, just so long as he never becomes Supreme Leader. Sometimes its the chaos that does the cleansing. Paul, you think that Glen Lazarus, as thick as two bricks and Senator Lambeth with a quota of 25k votes from Tasmania – a NSW senator has a quota 500k voters, but each of their votes has the same power in the Senate- in company board meetings you vote the number of shares you hold -you think they will shake things up? really? What do they know about power in politics? What experience have they had in government? Neither has ever been in government. understand how ignorant they are.! What a sorry pass Australian politics has come to. They’ve already shaken things up. Where have the “experienced” politicians got us so far? Isn’t democracy supposed to enshrine the right of participation for you and I, no matter how nuts we may be? If you want your politics confined to “experienced” people then China has a nice Politburo waiting for you. When people in charge of me are nutty, I’ll know i”m in the nut house. I want an experienced pilot, one who knows the way so that I don;t end up wrecked on rocks or aground on an unseen shoal. You may want nuts to lead you. Good for you. But I know how things will end up,looking ahead a bit. Julia Gillard, Kevin Rudd…..Firm hands on the tiller guiding you through the shoal? The Heiner inquiry which had no political taint began after Her Royal Majesty was summonsed. The Fitzgerald inquiry which had no political taint began after a Nationals Minister called it into being. Her Royal Majesty has been summonsed to the LNP control over the Courts. Reply from Her Royal Majesty not yet been received. Clive’s purpose in having those he owns set up the Clive inquiry was to block both Her Royal Majesty and Fitzgerald investigations. Clive and those he owns stay silent, an Investigation established under the hand of Her Royal Majesty has the power to change things wether Clive or the LNP like it or not! Clive advising’s to both, the Senate has those matters under investigation, any further investigation would only impede on the Senate inquiry. Clive Palmer gave specific instruction to the Members and Senators he owns, they must not allow any independent investigation into the LNP or Clive’s involvement. The People of Qld and its Police had such much trust in the Fitzgerald inquiry, they assisted it, and Police laid charges. Clive’s inquiry has no weight as it is purely a political investigation with purpose to satisfy Clive, not to bring about change. Clive knows his inquiry has the power to change nothing. Clive and those he owns have handed Qlders a $Millions dollar bill to satisfy Clive Palmer. Did you know Tony Fitzgerald has been a mate of former Labor Premier Wayne Goss since Goss won the state election in 1989. His wife is also a close friend of Goss’s wife, Roisin. The parents of these two women were also well known to each other. Goss set up the Queensland Court of Appeal on Fitzgerald’s recommendation and immediately appointed Fitzgerald as it’s first Chief Justice. After the initial enquiry Fitzgerald mounted on police corruption under the National party government of Bjelke-Petersen, Fitzgerald scored three further enquiries at vast payments per diem all for Labor governments. His lifetime pension and benefits which flow to his wife if he dies first are jaw-dropping. This is despite him running a mediation practice in central Sydney to this day. As for Carmody, he is just as qualified as any other competing individual to be CJ of Q. The thing is Labor has never been in power in the modern era when a Chief Justice has resigned or died in office. The Labor hierarchy (read Shorten’s mate Bill Ludwig et al) is so annoyed that Anna Bligh missed out on appointing a Labor legal mate by only two years but that’s the way the cards fell. As for Carmody being unpopular, he’s only unpopular with the Labor hierarchy in the legal profession virtually all of whom were appointed by Labor Premiers Goss, Beattie or Bligh. The Premier of Queensland has the sole right to appoint state Governors and Chief Justices under the state constitution. Regarding Palmer, what do you think would have happened if Newman had just handed the Galilee basin rail contracts to Palmer on the strength of Palmer’s one page submission compared with a one hundred page submission by associates of Gina Reinhart (whom Palmer hates with a passion). He would have been rightly condemned by Fitzgerald and the rest of the Labor cognoscenti elite in Brisbane. in the know, well written and shows you are “in the know”!